How would you describe your style? Anything I like or anything that I'm comfortable in. What are your favorite pieces in your closet right now? My mustard colored pants from Forever 21 and a grey blazer I got from Costa Blanca. What are your favorite trends? French braids, solid nail polish, and bows. What are your favorite accessories? Lip gloss, pearl ring, leopard clutch, watches, and nail polish. What are your favorite trends? I don't even know how to answer that. But I really am into the modern East Indian look...like the loose pants with tight bottoms and the fun bangles. Oh, this post was so lovely! I liked them both a lot, you can say them they are absolutly gorgeous! This bun and skirt are really beautiful and also the yellow colour in winter is awesome! Aw, they are so cute! That would be awesome to have sisters (or sister-in-laws) that love to go thrifting! I absolutely love that yellow dress! that skirt and dress are really unique and fun. I absolutely love the style of your blog. I'm your newest follower and look forward to all your posts and ideas! 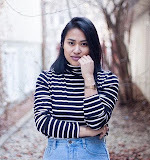 If you have a chance, I'd love for you to check out Nautical Stripes ! always so stylish! this makes me really miss you guys! the snow doesn't make me miss winnipeg!